Montgomery, the Strubbe brothers, Reinhart, Derr, Blankenship, Starr, Hofer, Dake and Guss. Those are just a few of the scores of drivers who thrilled racing fans in the 1960s and beyond at Davenport Speedway. Now, sadly, one by one they are departing, leaving just memories of the grand times everyone had. Most recently, it was Ray Guss Sr., 73, of Calhoun, Ga., formerly of Coal Valley. He died Nov. 21, 2013, at his home, with his wife of 54 years, Margaret, by his side. 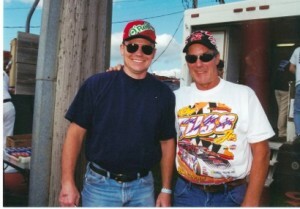 Ray Gus Sr raced late model stock cars for many years and was a mentor to his driver son, Ray Jr. Following retirement from Case IH, Ray moved to Calhoun, where he restored old cars. 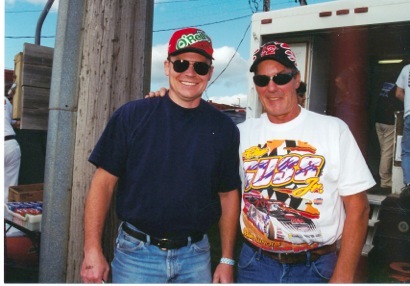 But he and Margaret often returned to the Quad-Cities to visit family members and watch Ray Jr. race. Ray Sr. always took time to talk to old friends in the pit area about racing and his hobby. With some of us he’d proudly share photos of his restoration work, and that made us feel mighty special. I took the photo above of father and son at a NASCAR All-Star Series race in Freeport, Illinois. It was probably in the late ‘90s, and it’s one of my favorite racing photos.